I love to experiment with different ideas in our own home and thought this was a fun one! I will admit, there was a glass (or 2) or rosé involved but I’ll also admit, this isn’t the first time I’ve done this. More on that later.. but for now.. you may be asking, WHY did I add wallpaper to our island? And will it be staying? The base of our kitchen island gets so beat up. With shoes, stools and a lot of kiddos, this space is definitely a “high traffic” area and in need of a fresh coat of paint. In the meantime, I thought I would try an idea and use removable wallpaper to cover it up and add an interesting pattern to our kitchen. I happen to have this beautiful, peony print wallpaper from Rocky Mountain Decals (a favorite wallpaper source of mine) left over from a friend’s nursery. I had just enough panels for the base and knowing that it can be removed without damage, I gave it a try! Our homes should reflect our personality and be functional. It’s a very girly print so it’s perfect for a house with three little girls. They love it and although it is not a permanent thing for us, it certainly is functional. So will it be staying? We’ve had it up for 2 months but it probably won’t be staying much longer. It’s a very subtle print but I think it’s a little too much for Eric now that we just wallpapered our dining room with a huge floral print! Did you guys catch that post? I was DIY install that I’m pretty proud of. 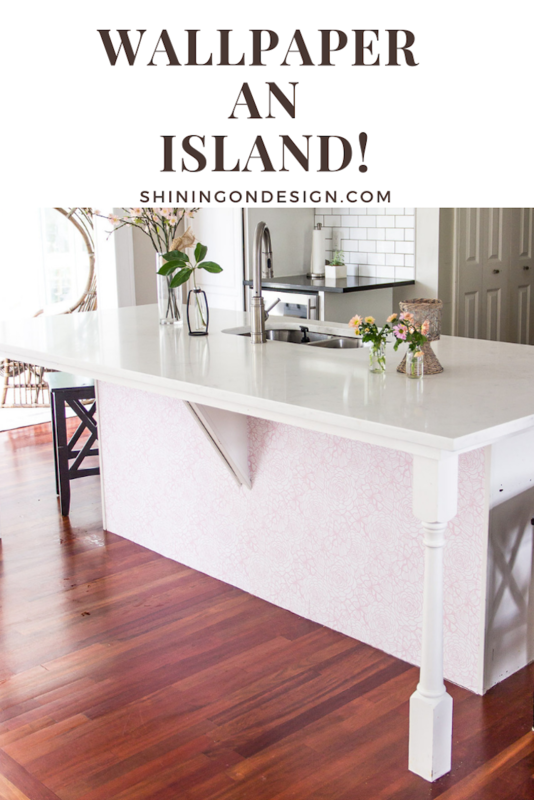 Back to the first time I wallpapered an island base…. About 3 years ago I was working with a client who had a rental studio in the city. Her one request was that it DIDN’T look like something from a catalogue (I LOVE when clients say this to me). We wanted to make it look fun and unique (personal to HER) so I thought of some creative ideas. 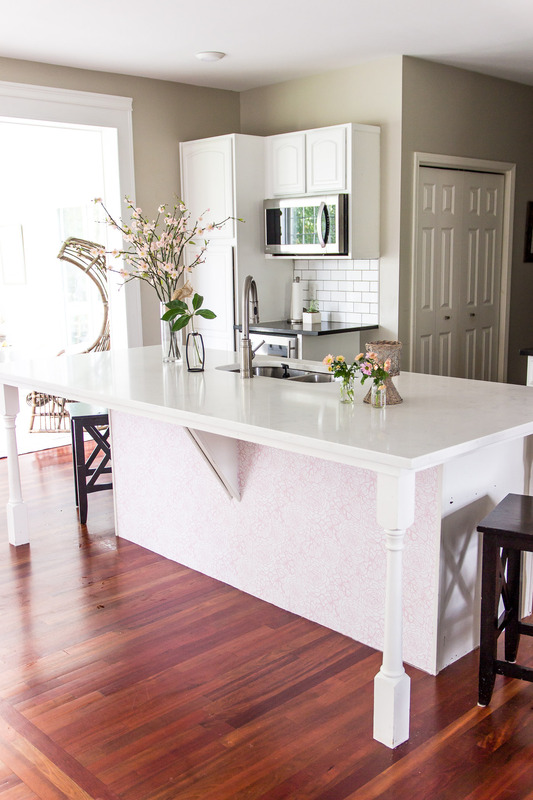 We used temporary, removable wallpaper on her kitchen island and it looked amazing. 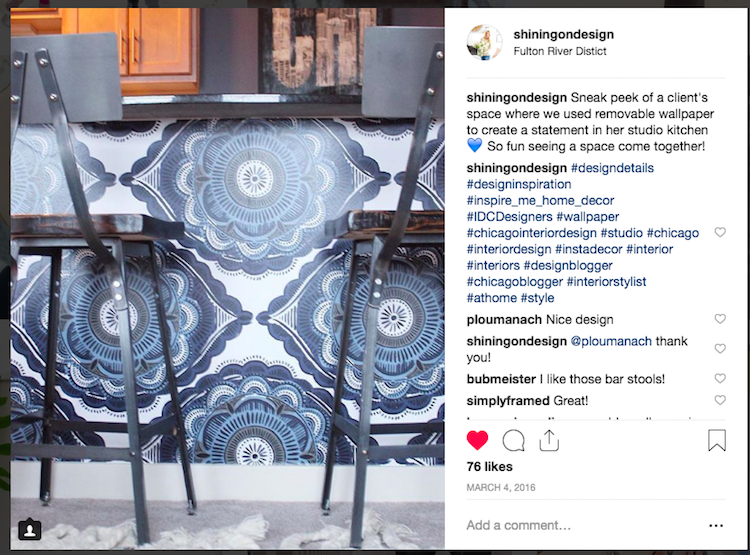 I wish I had pics of her place still but this is a fun way to add a pop of pattern in a small space too! This is one photo I dug up from an instagram post awhile back…. You can find similar stools here. And the wallpaper here. 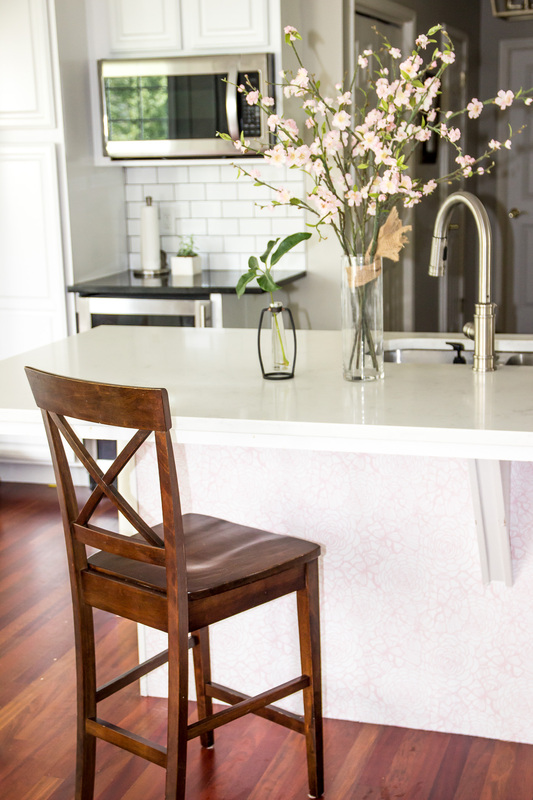 So, I’d love to hear, would you ever wallpaper your kitchen island base? Share with me if you do! * Pin image below and save for later!